Fujifilm Prescale® is a unique, affordable and easy to use tool that reveals coplanarity across your BGA or QFN application. 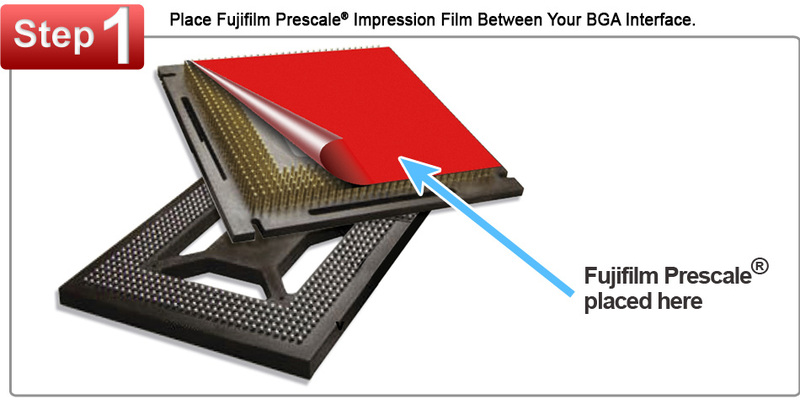 Fujifilm Prescale® sensor film reveals both pressure distribution and magnitude between contacting surfaces in a dramatic surface "map." When placed in your interconnect interface, the film instantaneously and permanently changes color in direct proportion with dimensional uniformity and out-of-plane conditions. Detecting missing, damaged, and out-of-position balls is easily determined by comparing the resultant color intensity to a standardized color correlation chart. No training or instrumentation is required. Quickly and inexpensively determine ball height uniformity and coplanarity across the contacting surface. Indicate warpage directionality (concave or convex) as well as severity of warping, using temperature controlled fixturing. Indicate uniformity of spring-loaded plunger-pin forces across the face of BGA sockets on PWB pads. Indicate uniformity of contact force distribution in mating surfaces in a wide variety of interconnect / test applications.